Moving a predictive model from the data scientist's desktop to the production environment is a "no brainer" with PMML, the Predictive Model Markup Language. Once expressed in PMML, a model can be operationally deployed in minutes. 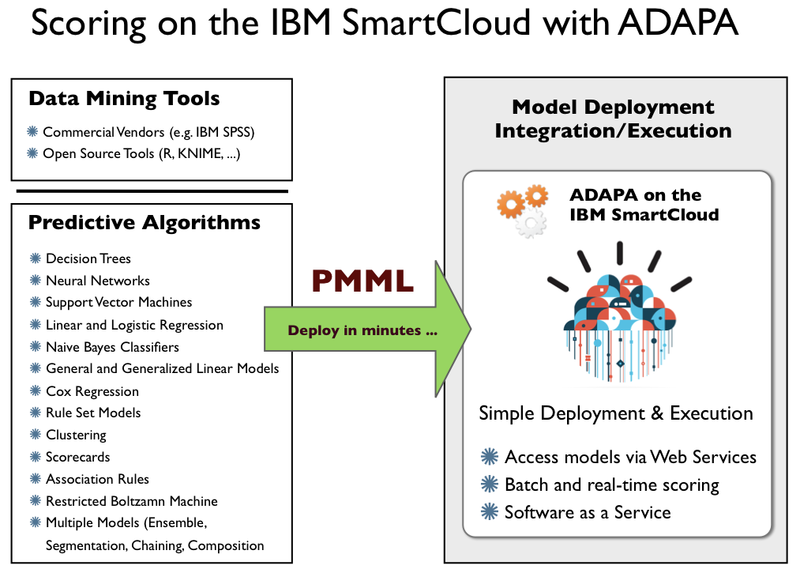 ADAPA, the Zementis PMML-based scoring engine, allows for predictive models to be put to work in a host of different platforms and systems, including the IBM SmartCloud Enterprise. 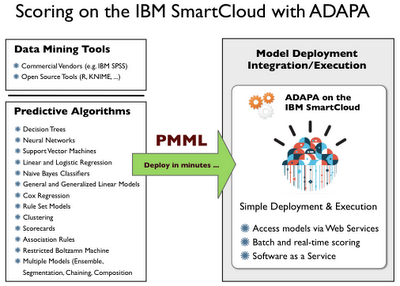 Since ADAPA is offered on the IBM SmartCloud as a service, users only pay for the service and the capacity on a monthly basis, eliminating the necessity for expensive software licenses and in-house hardware resources. With PMML and ADAPA on the Cloud, one can deploy a predictive model in minutes anywhere in the world in any of the available data centers. The process of launching a virtual ADAPA server in the IBM SmartCloud corresponds to the traditional scenario of buying hardware and installing it in a server room. The only difference is that the server in this case sits in the cloud, comes with a preinstalled version of ADAPA, and launches in just a few minutes, on-demand and ready to be used. At any given time, you can have one or more instances running. Independent of processing power, each instance type provides a single-tenant architecture. The service is implemented as a private, dedicated instance that encapsulates predictive models and business rules. In this way, access (via HTTPS) to any instance is private. As a consequence, decision files and data never share the same engine with other clients. Open-standards and cloud computing make it easier for companies to tackle the big data challenge. Predictive analytics is finally delivering on its promise of transforming data into insights and value.